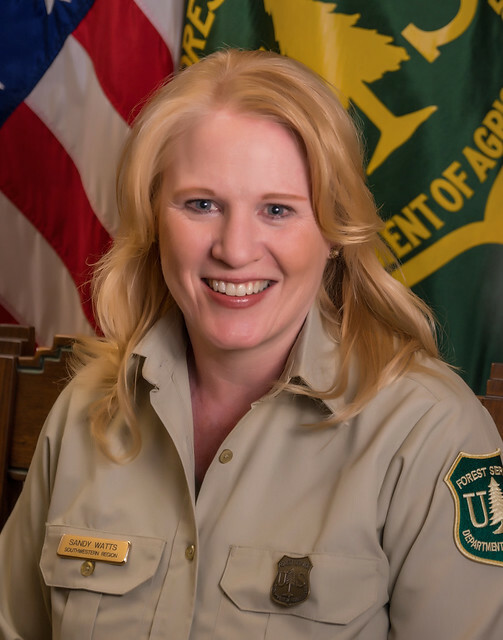 Sandra “Sandy” Watts, USDA Forest Service Region 3 Deputy Regional Forester in Albuquerque, New Mexico. Tell us about your background. What sparked your interest in agriculture? I’m the daughter of a fire management officer who was a smoke jumper. He started his career in Missoula, Montana. That’s what sparked my interest, because the National Forest has always been my backyard. I grew up on a ranger district in one of the compound houses. My dad always wanted to see his children make a career in federal service. He worked on me until I applied to a job at the Forest Service. He was also a big influence on my son who is also a firefighter. There are three generations in the Forest Service. Tell us about your various roles in the Forest Service? I worked my way up the organization. I started at the front desk at the Kootenai National Forest in Libby, Montana. Next, I went to work in directives and records as a filing clerk. After that, I was a computer specialist. Later, I went to financial management as assistant director, then I went to the deputy chief’s office as the records information manager for business operations. Then I went to the chief information office as the assistant director for enterprise business and solutions. And now I am Deputy Regional Forester. I had great mentors and coaches throughout my entire career. My number one role model is my dad because he got me into the agency. My husband, Mike Watts, was one of the first folks who helped me navigate the computer world. My daughter is a huge role model, she has a different way of approaching things. We help each other a lot and act as each other’s mentor and coach. What personal challenges have you encountered and how did you overcome them? I don’t have a lot of confidence and I’ve had to work hard to overcome those emotions and feelings. I’ve developed strategies to push the little Sandy back so big Sandy can come out and do great things. What advice would you give to young women who want to enter agriculture? I would say follow your passions, speak up, don’t be afraid to speak your mind, and point things out when you have something to share. Set goals for yourself and do whatever you need to do to reach those goals. We’re in a male-driven field and it doesn’t have to be that way. We’ve got to break that glass ceiling. We have to do it by being ourselves, and being strong and passionate in what we believe in. My family inspires me the most. My husband and I have five children and nine grandchildren. We love to be with our family, we love to travel with our motor home and do fun things outdoors. We love to golf, this weekend we’re going to the Nache Hot Springs in Taos, New Mexico. A typical work day for me is a lot of meetings and interactions with people. That’s what I enjoy the most, working with people and helping people. I tend to push folks to do a better job communicating with each other. Because of my background, I stood up all the collaboration tools in the agency (the enterprise email chat, live meeting). I always consider that my greatest accomplishment and my biggest failure. To me, it put a computer screen in front of everyone and took away the value of talking, being in conversation. I’m always pushing people to get from behind their computer screen and their phones have conversations and be in dialogue with one another. What advice do you have for fellow women in agriculture, both in USDA and in the private sector? The Forest Service has such an incredible mission of conserving and protecting our federal lands for multiple uses. Being a second-generation Forest Service employee and growing up with the National Forest as my backyard, nature is so important to me. If that is what is important to you, then we need you to join us! We need to attract women into agriculture and inform them that we help to preserve our public lands and feed our people. It’s such an important mission and important job. If that is your passion, please join us!